I was on vacation yesterday, the tail end of a Fourth of July out-of-town weekend, but one piece of news was inescapable — Pearl Jam had announced a show in Spokane (November 30) and my inbox was full of emails from friends and strangers alike. This is remarkable in and of itself because I have believed for more than a decade now that Pearl Jam is the greatest American rock band of all time, an assertion that is never less than contentious upon utterance, especially among Grateful Dead fans. If I’m absolutely pressed to say my favorite album of all-time, I will say Pearl Jam’s Yield. And if they ask my favorite band, I typically settle on Pearl Jam. 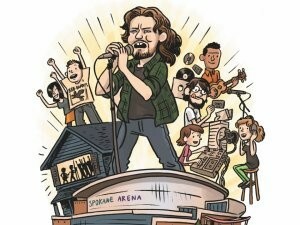 But it’s doubly remarkable because I wrote a brief entry in a piece we ran in The Inlander around the New Year about resolutions we had for the local music scene in which I said the Spokane Arena needs to bring Pearl Jam. I asked Leah Sottile, our former music editor, what I she wanted for these “resolutions.” Essentially, my resolution for our music scene was to bring my favorite band, or at least an amazing arena-sized rock band that wasn’t Nickelback. It turned out to be the most accidentally prescient thing I’ve ever written. Gibson didn’t necessarily expect anything to happen, but soon he heard back from the agent, who told him it would be a “hell of an idea” to bring Pearl Jam to Spokane and to hold a couple dates at the arena. A few months later, he got in touch again and the wheels kept turning to the point that it was actually, really happening. He says he’s also heard that Pearl Jam bassist Jeff Ament, a Missoula native, came through town and also saw the article, but isn’t sure if that’s exactly true. Either way, it’s a damn nice surprise to see it actually happen. And as a bonus, it looks like the band is also set to release a new album in the months leading up to the show. This is the latest show announcement in a slate of bookings for the Arena that includes Nine Inch Nails, Macklemore and Ryan Lewis and, of course, that Bon Jovi announcement and marketing stunt everyone was talking about. Pearl Jam is a coup for the live music scene here in Spokane. And I’ll go ahead and pre-defend against the “Pearl Jam is sooo ’92” argument. Yes, their most popular record came out more than 20 years ago, but the band has continually sold out its shows and maintained a dedicated fan base that’s almost incomparable. Perhaps, though, I should let Cameron Crowe’s documentary make the argument for me. For Gibson and the Arena, they know this is a big deal. “It’s been a lot of work in the last couple of years. I’ve really become an evangelist for this building. We’ve been doing lots of outreach to people around the country to make shows like this happen,” he says. And all of this, of course, shows us that sometimes dreams do come true.